Cannabis operators may soon be spared the arduous lengths to which they must go just to pay their taxes. State Sens. Toni Atkins and Scott Wiener hope their Cannabis Safe Payment Act — introduced Tuesday as SB 148 — will ease that burden by expanding the number of sites that accept cannabis-related taxes and fees. Because the federal government still treats cannabis as a Schedule 1 drug, banks balk at opening accounts for cannabis businesses. The Board of Equalization, California’s tax collector, processes some $40 million in medical cannabis sales taxes each year through its 22 offices scattered across the state. Even mid-size dispensaries find themselves hauling gaudy sums. 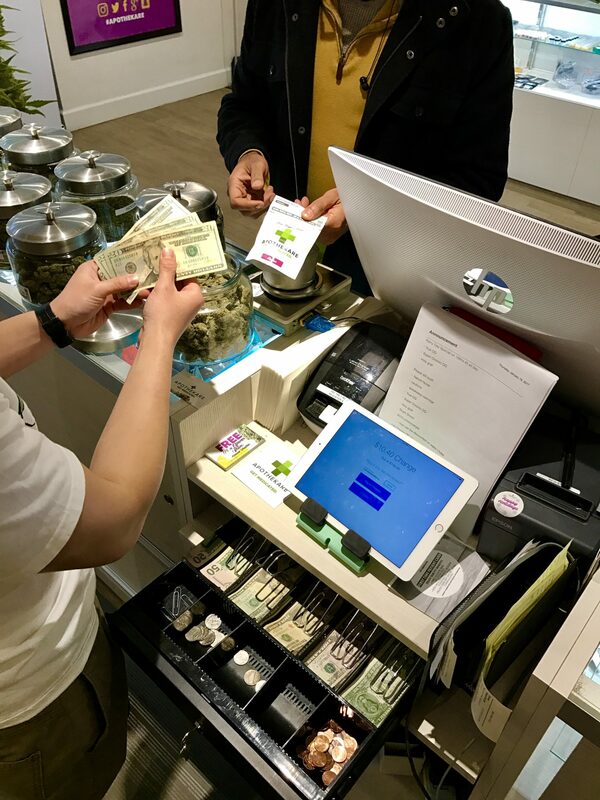 “It’s just not comfortable driving with $20-, $30-, $40-grand to make these payments, sometimes all in $20 bills,” said Alex Scherer, owner of the Southwest Patient Group dispensary in San Ysidro. San Diego’s office is just north of Poway. The nearest others are in Palm Springs and El Centro. For huge swaths of the state, cannabis operators are hundreds of miles from the closest BOE office. At Will Senn’s dispensaries in San Diego, tax payments are taken off site and kept under 24-hour surveillance — with security guards, alarm systems and cameras — to await delivery at tax time. All told, the precautions cost him thousands of dollars. The cash conundrum will get even more complicated next year once the state’s long-awaited licensing framework kicks in, when cannabis operators will face an array of fees to any of nearly a dozen agencies, many of which have few if any offices outside Sacramento. The Safe Cannabis Payment Act would broaden the kinds of payments that the BOE can collect. It would also allow counties and municipalities to empower their tax-collecting entities to accept state cannabis payments. Fiona Ma, BOE chairwoman, helped craft the bill. Todd Gloria, D-San Diego, is co-authoring it in the Assembly. A similar effort fell short last year by virtue of being obscured by the blur of marijuana reforms, said Hezekiah Allen, executive director of the California Growers Association, a trade group that represents 700 members. Don’t make us do anything. Don’t make us spend more money. Give us more money. That’d be the short version of San Diego County’s 2017 legislative agenda. The agenda, which was adopted last month, lays out the things the county wants to support and oppose in Sacramento and at the federal level. The list of concerns and hopes goes on for more than 100 pages. Many local governments have such lists, since a simple change at the state or federal level can have profound consequences for how much control local elected officials actually have. The plan is drawn up by county departments and the Office of Strategy and Intergovernmental Affairs and then approved by the Board of Supervisors. It’s executed in Sacramento with the help of two outside lobbying firms, JGC Government Relations and Nielsen Merksamer Parrinello Gross & Leoni. It’s hard to discern what the biggest concern or hope is because a list of “priority issues” runs for 56 pages. County spokesman Michael Workman said that’s because there are “so many potential legislative programmatic and funding impacts” on which to focus. The county wants more money from the state for jails and corrections, road repair, health care, prescription drug abuse treatment, fire prevention, water infrastructure projects, an earthquake early-warning system and pest control. The county doesn’t want the state to make it bear more burden or responsibility for housing prisoners and cleaning up rivers and streams. It wants some tweaks to the law, particularly ones that would give it more flexibility in deciding how money is spent or things are done. It wants the governor to encourage Indian tribes to put their casinos near one another to reduce the impacts of having so many different casinos in the backcountry. It opposes recreational use of marijuana. It supports the construction of new electricity plants and opposes legislation that mandates local government to reduce greenhouse gas emissions without new money for pay for that work. It opposes offshore drilling. California lost two giants this week. Kevin Starr was the keeper of California’s history. The former state librarian and USC professor reminded us time and time again that “the California story is too wonderful, and too important, to walk away from,” Peter King writes in a wonderful tribute. The whole country has its eyes on California as it prepares to become a major foe of President Donald Trump. The San Francisco Chronicle has a great comprehensive feature laying out the many issues that could cause friction between the president and the Golden State, what each party wants and possible outcomes. California Sunday, meanwhile, kicked off a series examining how the state plans to take on the president. This first story gives some remarkable details about how Senate President Pro Tempore Kevin de León, Assembly Speaker Anthony Rendon and Gov. Jerry Brown kicked into action immediately after Trump’s election. Also this week, Sen. Kamala Harris aggressively questioned Trump’s nominee to head the Environmental Protection Agency. At issue is California’s ability to set environmental rules that go above and beyond national standards.